We’re both big fans of Smugglers Cove, and sometimes one feels a little splurgey when celebrating. This week I had one of those occasions, so, finding myself at Smugglers, I looked through the list for splurge-worthy whiskies. 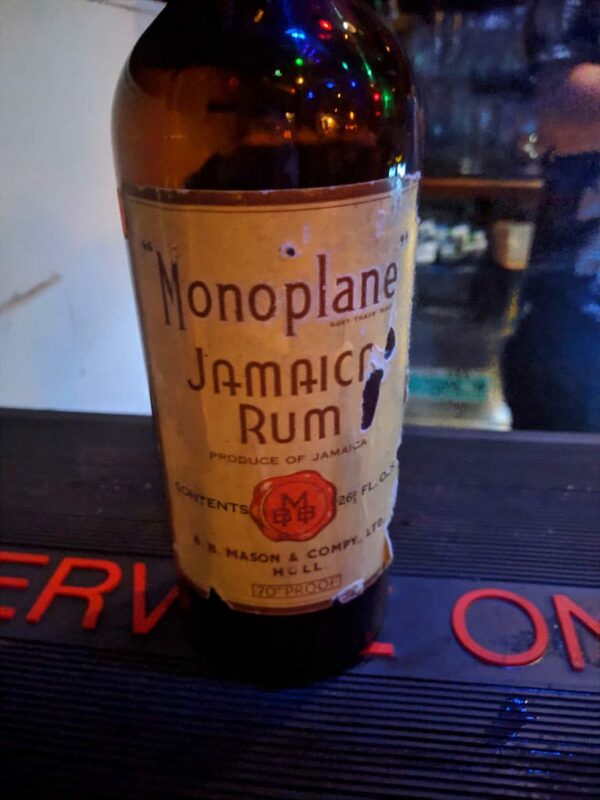 Anywho, today I decided to try Monoplane Jamaican Rum from the 1960s. Not the world’s most accessible rum. Nose: Some faint Jamaican banana estery-ness, but you really have to search for it. Palate: Lots of burnt rubber, like the pavement at the Indianapolis 500. The Jamaican esters punch through though, and the whole thing is nicely balanced. Some sweet brown sugar mid palate. Not a very long finish. Overview: Some of that Jamaican funk remains, but it’s muted. Heavy note of rubber. Bottled in the 1960s by BB Mason & Co Ltd.
Monoplanes have one wing! How modern, no more bi-plane stuff. Google yields no search results for Monoplane rum. Company is no longer extant.